Commemoration of the first anniversary of Gran Ravine's Massacre.The parents and friends of victims of July 27 massacre walked with tears, Jul. 27, 2007. Photo by Wadner Pierre. The following are my responses to an anonymously posted criticism (on the Haiti Corbet Listserv) of the work of human rights investigators Evel Fanfan (AUMOHD) and Tom Luce (HURAH) who have been highly active in Haiti's slums of Martissant and Gran Ravine since 2005, and, this post is also in response to some of the misleading journalism done by former Economist Intelligence Unit correspondent Michael Deibert looking at political violence in these communities. I would prefer here to discuss the content of this coverage of political violence. On the assassination of Jean-Remy Badio, Deibert cites the ACM statement. This statement says nothing about Lame Ti Manchèt-which according to witnesses, family, friends, and several Haitian media outlets at the time were the primary suspects (and the main force propelling violence in the area). His article for AlterPresse dated Feb 12, 2007 likewise never mentions that the main suspects in Badio’s killing were the members of Lame Ti Manchèt. Michael Deibert's Aug 2, 2006 IPS article does well to mention Lame Ti Manchèt's alleged connection to Carlo Lochard, but it says nothing else about this armed group: (1) it does not explain how the group was the primary source of local violence according to community organizers and the main human rights investigators active constantly in the area, and (2) it does not mention the other two major attacks in the area that had already been carried out by Lame Ti Manchèt, these were the house torching in Gran Ravine conducted by Haitian police and Lame Ti Manchet on 21 August 2005 and the massacre of twenty innocent men, women and children along with the torching of three hundred+ homes in Gran Ravine conducted by Lame Ti Manchet on 7 July 2006. I would also like to respond to the Haiti Corbet Listserv post of ‘41241 anonymous’ criticizing the work of Tom Luce and his close friend Evel Fanfan, both of whom are well-known to many residents of Martissant and Gran Ravine. One hero of that community, Esterne Bruner, a father of six children, who worked closely with Tom and Evel, was murdered by paramilitary forces when he was organizing local human rights councils in that community. As with the important work of IJDH, BAI, and AI in Haiti, HURAH and AUMOHD have done a lot to gather data and information on attacks against poor communities in Haiti (& organize for justice). HURAH & AUMOHD's work has especially focused on the communities of Martissant, Gran Ravine, and the Plateau Central. These human rights groups have done invaluable work in documenting assassinations, massacres, house burnings, rapes, etc. Evel and Tom, and their network, have supported orphans of the violence, such as Widnise Jocelyn, an eight-year-old girl, who lost her mother, father, sister, and godmother during one of the massacre in Gran Ravin carried out by pro-coup gangs supported by elite sectors living in Pétion-Ville. Jocelyn remains in the care of the Gran Ravin Community Human Rights Council (GR-CHRC) established by AUMOHD. For a great deal of time, she was in severe shock based on these events. The 'anonymous' poster refers to the work of Michael Deibert as providing a more accurate story of what happened in these areas, however, accounts of witnesses on the ground and human rights investigators tell a very different story than the articles published by Michael Deibert in AlterPress and IPS. This is because Deibert has essentially ignored the role of the largest and most violent armed group in the area at that time: Lame Ti Manchet. 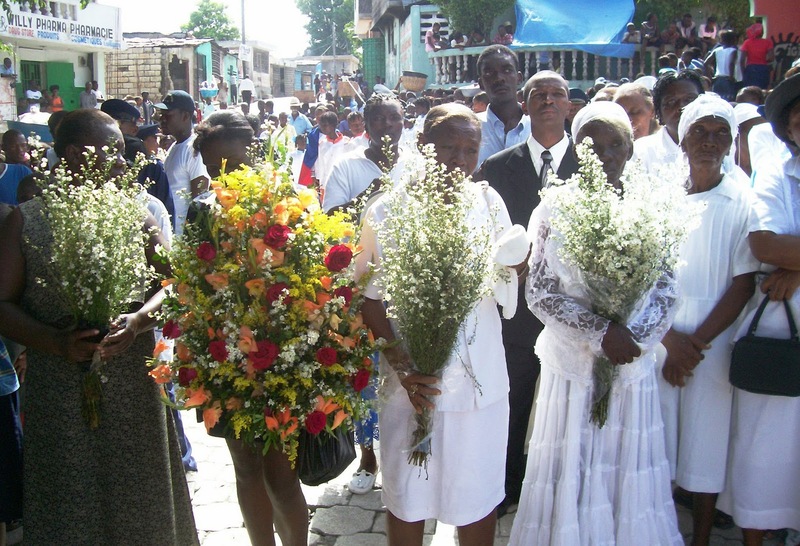 -20 August 2005: Massacre at Bernadette soccer field in Martissant conducted by Haitian police and Lame Ti Manchet. An NYT video report put together by Walt Bogdanich and his team shows footage of the attack that were carried out by Lame Ti Manchet attaches backed by police under the illegal Latortue government. -21 August 2005: House torchings in Gran Ravine conducted by Haitian police and Lame Ti Manchet. -7 July 2006: Twenty innocent men, women and children massacred plus three hundred+ torched homes in Gran Ravine conducted by Lame Ti Manchet. -28 September 2006: Human Rights coordinator Esterne Bruner assassinated in Gran Ravine after returning from AUMOHD's office. Lame Ti Manchet is suspected. -19 January 2007: Photojournalist Jean-Remy Badio assassinated in Martissant. Lame Ti Manchet is suspected (friends, family, AHP and Le Nouvelliste). Michael Deibert (and Reporters Without Borders likewise) failed to properly attribute the major suspects of this assassination. -Throughout this time period: Evel Fanfan received death threats and was forced to get police protection on numerous occasions. According to Luce and others working consistently INSIDE these neighborhoods, in his reporting, Deibert obscured the proportionality and details of the violence that occurred. Luce explains rather "the mission of AUMOHD/Hurah/CHRC-GR is to discard the insane proxy war and organize the good people to work for social justice." While Deibert does report on some of the violence, he provides little of the overarching context and ignores most of what happened.